Think you’ve got a central heating leak? Cheshire Plumbers are an established plumbing company servicing the Cheshire area specialising in finding and solving central heating leaks in homes. 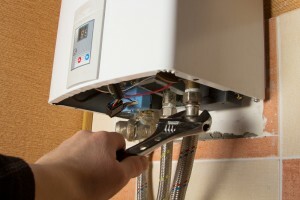 Dependant on your type of central heating system, a leak can sometimes go ignored for long periods of time, but can cause damage to your home if left unremedied. With modern systems the first sign of a leak may be your boiler shutting down as they are designed to cut out if pressure drops below a certain level. They can usually be re-pressurised but this will continue happening until the leak is fixed. If you suspect a leak we can provide an expert central heating leak detection service, which enables us to find the leak quickly and with minimum damage incurred. With traditional methods of central heating leak detection, a plumber would have to replace whole areas of piping, or pull up large areas of your walls/floor to find the faulty element. Our central heating leak detection uses state of the art technology to scan the area and focus in on the source of the problem. Our skilled plumbers can then fix the cause of the problem usually just by replacing the faulty section of the piping, to get your system back up and running. If the problem isn’t a leak, our team are trained in all areas of plumbing and are Gas safe and Oftec qualified to ensure that any faulty element of your central heating system can be fixed. We provide a free estimate on all of our central heating leak detection and plumbing & heating services and provide you with a quality service throughout. If you would like to find out more about our central heating leak detection or heating services then please get in touch with a member of our expert team who can answer any questions you may have.